Allyson R. Perez ’17 was climbing into bed in her room on campus when the text message flashed across her screen at 1 a.m. Saturday: Fidel Castro was dead. Perez, who is Cuban-American, did not believe it. Castro, who ruled Cuba as the country’s “Máximo Lider” from 1959 until 2008 and defied 11 American presidents along the way, died Friday. He was 90. Among Harvard’s Cuban-American students and faculty, Castro’s death inspired reactions ranging from jubilation to ambivalence. 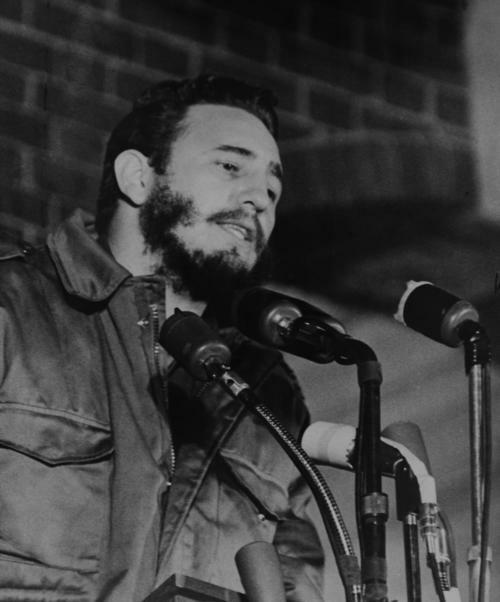 Some in Cuba revere Castro as a revolutionary hero who guided the small island nation to global relevance, and as a strong leader who never submitted to the demands of the U.S. government. Others see him as a repressive and power-hungry despot who tried to control every aspect of Cuban life, down to the color of Cuban soldiers’ uniforms. Castro inspired socialist insurgencies across Latin America and brought the Cold War to the Western Hemisphere with his successful overthrow of Cuban dictator Fulgencio Batista in 1959. Later, Castro nearly pushed the world to the edge of nuclear war. To Marlon Seijo ’18, Castro’s death was cause for celebration. Seijo was back home in Miami, Fl. for the Thanksgiving holiday, attending a late-night reunion with a few high school friends, when he heard the news. Thousands of Cubans–including Seijo’s parents and several of his grandparents–fled the island and came to America when Castro took power in the ’60s, fearing political retribution. Seijo said the vast majority of students at his high school were Cuban-American. Seijo drove home early that morning and woke his parents to tell them Castro had died. Both had to check major news outlets before they believed him, Seijo said. Once Castro’s death “hit them,” neither could go back to sleep, so Seijo and his family stayed up to celebrate. Seijo said the mood in the “Cuban exile community” in Miami was ecstatic Saturday. Though few expect immediate change in the Cuban government going forward, many Cuban Americans in Miami see Castro’s passing as a “symbolic victory” marking the beginning of a transition to a “new era,” according to Seijo. For other Cuban-American Harvard affiliates, Castro’s death led to mixed emotions. Both Perez and government professor Jorge I. Domínguez, who was born in Cuba and serves as the co-chair of the University’s Cuban Studies program committee, said Castro’s career and legacy permit multiple interpretations. Domínguez said he learned of Castro’s death Saturday morning but had to double check because he is “used to fake news” nowadays. Deeming Castro a “world historical figure” of almost mythic proportions, he said Castro’s record can be polarizing. “It’s not someone about whom one renders an easy judgment,” he added. Perez agreed, terming Castro a “divisive” figure. “There are people who will say that he is the worst thing that has ever happened to our country, and others who will point out all of the good things that he brought to Cuba,” she said. Perez noted Cuba’s high literacy rate and its universal healthcare system as two of these “good things,” but emphasized she thought Castro was a dictator who “killed and imprisoned” people he disagreed with, including members of her own family. Perez said the most fitting word to summarize her feelings on Saturday is “complicated.” She paused for a minute, searching for a different adjective. “It’s complicated, it’s complicated,” she said.